I am quite surprised that my total sewing output for the year is 14 garments and 1 quilt. The trench coat took so long to complete, especially since I was only working on it with my teacher once a week, that it seemed as if the whole project took eons. I had completely forgotten about my pants (can you believe that? I can’t). I also forgot about the wrap skirt I made at the beginning of the year. So I am very proud of what I have completed and how much. And let’s not forget how much I have learned! Wow! It’s a lot, but I am saving that topic for the next 2010 goals post I will write soon. So what was my favorite thing that I made? I think you’ll be surprised. 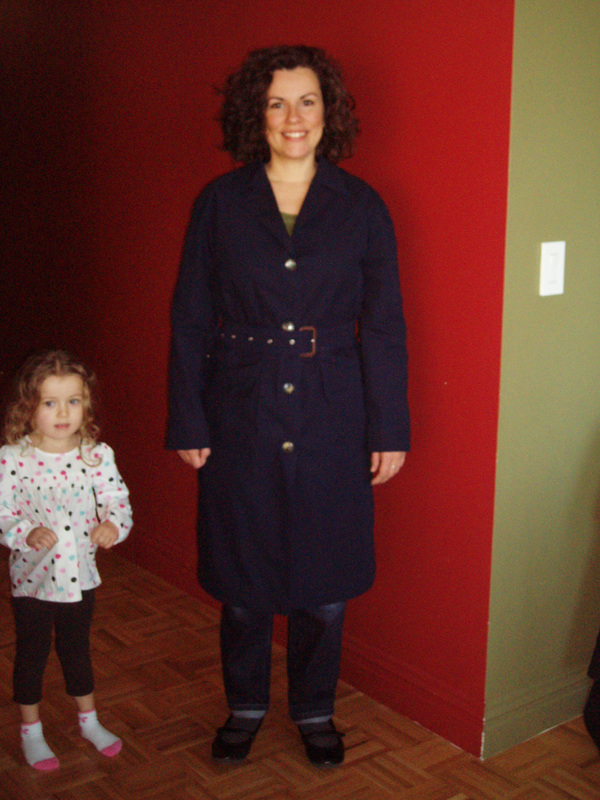 However, that does not mean I am not proud of my trench coat. There were so many firsts on this project. I am still in a state of disbelief that I actually made this coat. 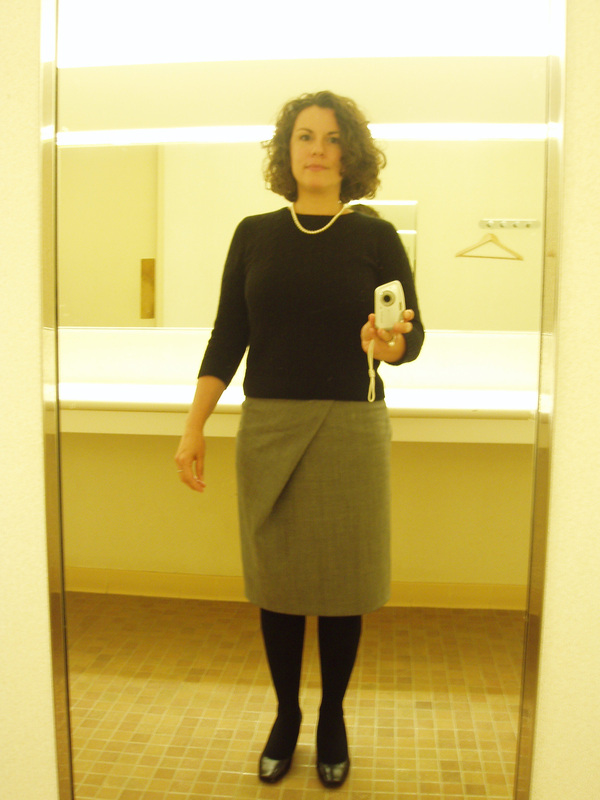 And the final highlight of 2009 would be attempting my first Burda garment. I had been very scared to work with Burda before this but I just fell in love with this skirt the moment I first saw it in the magazine. I was able to understand the directions (shocking to me actually because of Burda’s notoriety and also because I am a mite challenged in the reading directions area). Also, I made this skirt almost completely on my own, with my teacher instructing me on the finishing details only. So, can I say it again? I’m proud of myself. I may not be the fastest or most prolific sewist in the East, but I have come a long way. I look forward to sewing a lot more in the next year. I can’t wait for 2010. Bring it! Happy New Year everyone! May you be filled to bursting with sewing mojo and may fabric fairies gift you with bounteous yardage. Bravo! You had an excellent year. I look forward to seeing what you have for us in 2010! You had a very successful year! Thanks for sharing your projects. Happy New Year. Personally I think you had a banner year as a beginning sewist! You embraced your craft, was fearless with your sewing, learned new techniques and refused to quit! And since I’ve seen the dress on you I can vouch for the fact that it is amazing and you should be proud! Happy New Year to you and Jack! Well tackling a trench coat is no small feat! And you did it so well. Love the skirt and the dress. You’ve done great! The purple dress looks fabulous as does the trench coat. Looking foward to seeing what you make in 2010. You have mastered so much in one year. It isn’t just the number of garments-it is the tackling of the BWOF patterns and the skills you did not have the year before. Well done! Wow, I am so impressed. I am also a beginner sewer and have followed your blog avidly. Just one question, how do you find the time to sew??? I think you had a great year. Love the purple rain dress myself – the trench is great, but like my trench, it’s a trench, it’s not a dress that you can wear and smile at all day long. And sometimes the trench-type projects end up more as skill-builders than as the well-loved projects they should be. Glad you’re back home – I’ve missed having someone to email with when I’m supposed to be working.